The Wrong Century: I gots me some AMAZING jam! It's no secret that I love bread. Toast in particular is a favourite of mine. Well, the toast I had this morning for breakfast was the best I've had in a long while. Why? Cause it was topped with some *awesome* jam exchange jam! Thank you Steve for sending me so much amazing looking jam! I think he even said most (all?) of the fruit comes out of his So-Cal backyard garden. How cool is that? I love the jars and I love the labels! And they all look so tasty! I had a hard time trying to decide which one to open first!! I mean, don't they all sound amazing?? Green Fig Preserves, Apple jelly, Mulberry & Cranberry and Ginger-Plum. Which one would you open first? So thank you Steve for sending such amazing jam! I'm so happy we got paired up. I can't wait to try the rest. I'm sure they will be just as great!! Yeahhhh!!!! Steve makes the best jam!!!! Oh. I would have tried the apple jelly first. it looks great. Just joking - what are green fig preserves?! Go for those! Figs are delsih! Oh. You think you are So funny. I think preserves are like jam, but with pieces?? seeds? didn't we read the definition one time?? They do look tasty! I have a feeling "preserves" may be a bit of a misnomer. - In jelly, the fruit comes in the form of fruit juice. - In jam, the fruit comes in the form of fruit pulp or crushed fruit (and is less stiff than jelly as a result). 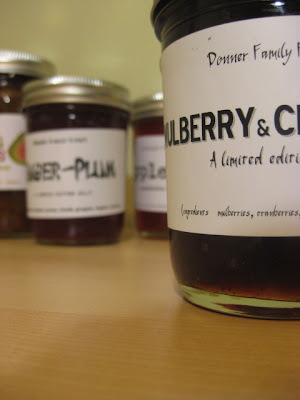 - In preserves, the fruit comes in the form of chunks in a syrup or a jam. Prolly shoulda' put "Jam" instead but "Preserves" just has more ... zing. Hubris, I guess. And now, I feel so dirty.